Can You Feel Hair Extensions In Your Head? I have had several women who have never had hair extensions ask me whether or not you can feel the hair extensions in your head. For some people, who are used to hair extensions this may sound like a silly question, but if you are nervous about getting hair extensions and you just want to make sure they are the right choice for you, then this is a very valid question. There was one gal I knew that was worried that her boyfriend would be able to feel the hair extensions when he touched her head and another who was nervous about being able to see the hair extensions if you got up really close to her. 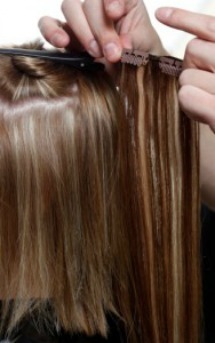 If you have thin hair or super fine hair, you may notice that your hair extensions can be felt in certain places. They will not be super noticeable and most likely will not be visible but there is a chance that you can feel them. If you have thin hair on the top of your head you can ask your hair stylist the best option for you so that you can’t feel the hair extensions. These sort of go together in that something like clip in hair extensions are going to be a lot more noticeable than ones that are professionally bonded or fused onto the roots of your hair. You will also notice that if you buy cheap synthetic hair extensions and you don’t take care of them properly you will be able to feel the difference between your real hair and the synthetic hair extensions. When it comes to other people being able to feel or notice your hair extensions you don’t really have to worry about this happening if you get them done professionally and use a technique like fusing or even sewing them into your hair. Most stylists who are trained in these techniques know the perfect way to hide the extensions and blend them in so that you can’t feel them or notice them unless you are really trying to do so. This means unless someone is actually styling your hair or running their hands all the way down your hair from the roots to the ends they most likely will never notice the hair extensions. When you first get your hair extensions you most likely won’t be able to feel them on your head as they will definitely mix into your own hair very well. Again, if you get them put in using anything else besides hair bonding or fusion you do run the risk of being able to tell where they are. As the extensions grow out though you will start to be able to feel where they are placed on your head but this also means it is time for them to be taken out or re-done.